Sir Martin Archer Shee P.R.A. Formerly attributed to the circle of Sir Thomas Lawrence, this portrait has been recently attributed to Sir Martin Archer Shee (1769-1850). Martin Archer Shee was an Irish portrait painter, who moved to London in 1788, where he enrolled in the Royal Academy Schools in 1790. He was elected an academician in 1805 and immediately after the death of Sir Lawrence, he was nominated President of the Royal Academy. In the same year he was knighted. Shee was an energetic reformer, critic and writer. In 1805 he published “Rymes on Art, or the Remonstrance of a Painter”, calling for national support for the arts. He gained a literary reputation and admired for his varied talents. Lord Byron in his “English Bards and Scotch Reviewers” refers to him: And here let Shee and Genius find a place, Whose pen and pencil yield an equal grace. Shee was also very interested in theatre. In Dublin, he studied in the department of dramatic literature and in his late career wrote a tragedy, Alasco, published in 1824. According to Strickland, “Shee was fond of the theatre and had many friends connected with the Dublin stage, some of whose portraits he painted”. When he moved to London in 1788, he found patronage under the actor and painter Alexander Pope, who introduced him to Sir Joshua Reynolds and procured him sittings from several of the well know actors of the day, including John Fawcett (1768-1837). Strickland lists two portraits of Fawcett, one (Fig. 2) in a dark coat with a white waistcoat (Sotheby’s, 15 January 1986), and a second portrait in the role of Touchstone in As you Like It., exhibited at the Royal Academy in 1797 (No. 354). As testified in a letter to his brother, dated 1789, Shee was engaged in making copies for Thomas Macklin’s Gallery of British Poets and Boydell’s Shakespeare Gallery. At the same time, his pencil was employed to portray famous actors of contemporary theatre, including Macklin’s farce Love-A-La-Mode (1759), which was extremely popular in the early 1800s. This half-length Portrait of a Young Man shows a gentleman in a dark blue coat, turned frontal, gazing left. The portrait is carefully finished, his likenesses rendered with brilliant touches of colour and presents the artist’s typical tendency to redness in the flesh. Interestingly, this elegant man is wearing a pair of small round glasses, suggesting that he might be a littérateur from a highly polished circle, with good tastes and scrupulous refinement. The same sitter is known in another portrait, in a highland dress, without glasses (Sotheby’s, 21 March 2007). In this portrait, the gentleman wears a Stewart tartan and holds a metal sword. The features of the costume suggest that the man is portrayed as Norval, a fictional character from John Home’s tragic play, Douglas. Home’s Douglas was one of the most popular tragedies in the mid-eighteenth century. It tells the story of Young Norval, the infant son of Douglas, who is supposed dead by his parents. Old Norval, a shepherd, finds and brings up the boy, who saves his stepfather, Lord Randolph's life and is then reunited with his mother. Randolph's heir, Glenalvon, however, threatened by a rival, stabs Young Norval in the back in a forest. In despair, Lady Randolph throws herself from a cliff. The play was presented in Edinburgh for the first time in 1756 and later in London in 1793. Many famous actors of the period were portrayed dressed as the Scottish hero, including William Henry West Betty (Fig. 3), Alexander Rae (Fig. 4) and Henry Erskine Johnston (fig. 5). West Betty, also known as the Young Roscius, was portrayed by James Northcote, RA (1746-1831) in 1805, wearing armour and tartan. The latters are known through reproductive prints. 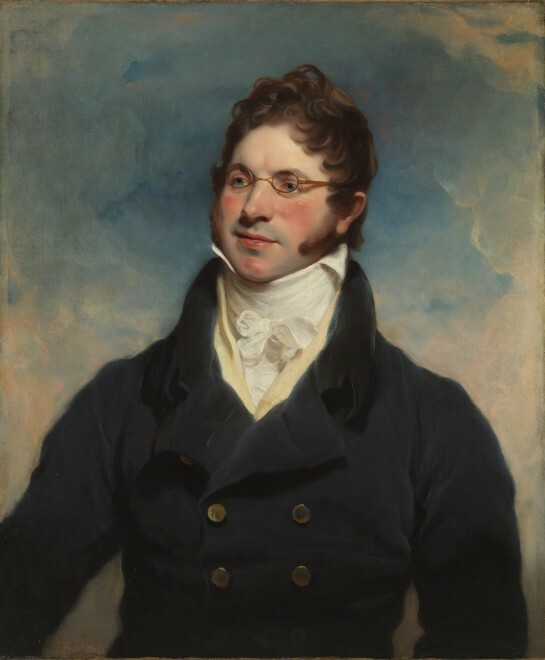 Home’s theatrical hero remained extremely popular in the following decades, with portraits of young gentlemen in the role of Norval painted by Charles Leslie (RA 1814, no. 257), Huge Ross (RA 1824, no. 928) and H. Pidding (RA 1833, no. 580). Sir Martin Archer Shee painted hundreds of portraits and had sitters from all ranks of society, including men and women, noble and military men, actors and poets. It is possible that the popularity of Shee’s works in theatrical costumes prompted the second portrait. This Portrait of a Young Man exquisitely encompasses the sentiments of ambition, progress and achievement of the artist’s literary and artistic circle of friends executed during the Regency period. The portrait has been dated c. 1810-1820, in the years of the artist’s active participation in the Literary Club and Society.